Xcode, the suite of development tools produced by Apple, might have finally answered the question about how much RAM Apple stuffed inside its newest iPhone models, and the new Apple iPad Pro. Throughout this year, there were countless rumors that the Apple iPhone 6s and Apple iPhone 6s Plus would have the amount of RAM inside doubled to 2GB. 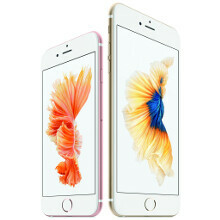 However, during the introduction of the new models last Wednesday, Apple did not confirm or deny the speculation. 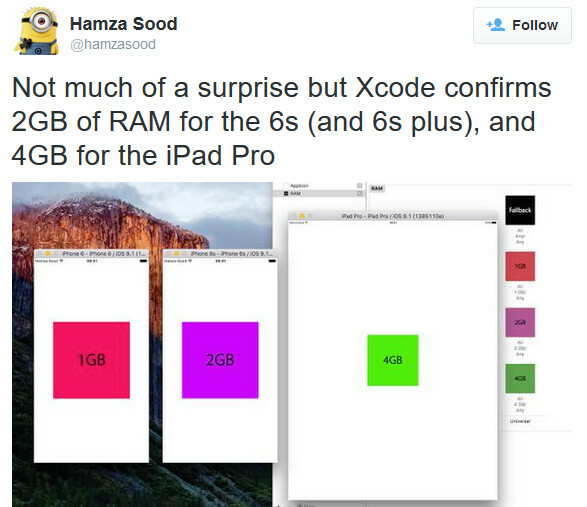 Images from Xcode seemingly confirm that Apple did indeed place 2GB of RAM in the iPhone 6s and iPhone 6s Plus, compared to the 1GB of RAM inside the Apple iPhone 6 and Apple iPhone 6 Plus. The larger amount of short term random access memory will allow iPhone users to more smoothly multitask between apps, and some graphic intensive games could run smoother. While top-shelf Android phones now offer 4GB of RAM, an Apple to apple comparison cannot be made. That is because iOS is optimized to run smoothly using less RAM than Android is. Xcode also confirms that the 12.9-inch Apple iPad Pro, also unveiled last Wednesday, features 4GB of RAM. That is twice the amount that Apple installs on the Apple iPad Air 2. Apple's partner Adobe accidentally revealed last week that 4GB of RAM is used on the iPad Pro, but quickly pulled the reference on an online document. Since when iFans started to care about RAM in their iToys? Since they realise that 1 gig is no longer enough and that 2 gig is what apple tells you what you need regardless. why does iPad pro has 4GB if iOS doesn't require. And if Apple had the tech, why didn't they give iPad pro features to iPhone 6S plus despite of it high price.. Wait minit "The larger amount of short term random access memory will allow iPhone users to more smoothly SWITCH between apps, and some graphic intensive games could run smoother" Fixed! True multitasking on an iPhone? BWAHAHAHAHA! "That is because iOS is optimized to run smoothly using less RAM than Android is." No....no it isn't more "optimized". If chopping off your arms and calling that more efficient and optimized is considered to be a good thing, then maybe it is. As all the speed tests have proven (the ones by phonebuff literally test RAM only in their second run), they aren't more "optimized" and designed to run smoother on lower RAM otherwise it would match the Android devices that beat it in those comparisons. It was literally hemorrhaged by a lack of RAM and now at least it can function. Apple finally gave their adoring fans their $1 worth of RAM at the expense of his majesty's treasury, so congrats. Idiot. If Apple devices weren't as optimized for iOS as they are, they wouldn't slaughter tons of Androids phones in tests. Be an Android fan, but not a Fandroid. Asking him that, is like asking a Great White Shark to be a vegetarian. Ain't gonna happen. well... android does hog a ton of ram, on my g3 it occupies 1.6GB of ram with no apps open, doing a reboot brings it all the way down to 1.5GB occupied, the fact that an iphone 6 with only 1GB of ram runs just as smoothly as my g3 says something. That's good. Reloading tabs on my iPhone 6 because of 1GB of RAM is annoying. Can be at times for me too. Two reasons why Apple did not mention the additional RAM. One, they wanted to brag about their A9 processor being much faster and more efficient, Two, Apple point has always been to prove that iOS is smoother of an OS than Android even with less memory. Otherwise, they would have said that the new iPhone s the only true smart phone with 2gig of RAM!!! :) We all know that the additional RAM helps a lot. iHaters should be jumping in happiness considering they wanted this memory upgrade so hard for the iPhone.... But they don't ? 4 gigs for iPad pro what you want to do with it play tow pages of candy crush on it? Hopefully resolves Safari constant reload and crash problems particularly on the 6 plus. I used to admire Apple so much but this is fading away every time a new iPhone is released. I think Apple is no longer putting user experience first, they put revenue first and they are getting too arrogant for their own good. Before I was a devoted Apple user, I was Nokia user, buying a new Nokia device annually till I dumped them in 2010 for Apple due to mediocre user experience on their devices. If iPhone 7 is not a good upgrade, it might be time to move on. Man I hope this is accurate info. I've decided to go ahead and give one a try, please be accurate on this. I knew you wouldn't be able to resist. You went from no split screen, no iPhone to no split screen 50/50 to no split screen, I'll get one. You should get holsters and double gun the Note 5 / 6s+. BIG holsters, mind you. Yeah, I gotta try it out. I know I'm going to keep going to play with it until I give in, and buy one. I have 14 days, so why not. If it indeed has 2 gigs of ram, those features could come later (wishful thinking). So what! Explain everything that's wrong with people buying what they want to buy. I'll wait. Oh, and for the record, I'll be in line with the 6 Plus I'm selling, and the Note 5 I love. There's nothing wrong with prefering an iPhone over something else, but there actually is something wrong if you're going to line-up to get it a few days before everyone else. It's just a phone, there are more important things in this world. Sleeping next to an apple store, come on.. It's just an iPhone, there's nothing so special about it to camp next to an Apple store. If you want that extra gig of RAM so badly then buy a Note 5 which has 4 GB of ddr4 RAM. But I'm not from the USA, I don't know if it's normal over there but here in my country we laugh at all those people lining up for a phone. Again: it's just an iPhone. It doesn't have mind-blowing specs compared to the competition. I guess most people see it as a status symbol, like that snake guy does. I figured you couldn't provide an intelligent answer, and would give a fanboy response. I asked you to say what's wrong, and this is your response. The trouble is that most people don't like cults; they associate them with Charles Manson or Red Sox fans. Sure, you may believe you have all the answers. But there are a lot of people who automatically tune out the incessant preaching of a zealot. With the rise of the Internet, it became much easier to preach that gospel far and wide and anonymously. "Like anything people are passionate about--sports, politics, religion--there are going to be some people who are goofy about it and don't have that thing in their brain that tells them they've stepped over the edge from 'fan' to 'fanatic',"